Interview with R. A. Harold, author of Heron Island, a Vermont mystery. Recorded in front of an audience at the South Burlington Community Library last week. First, try flipping through a newspaper and see if any ideas come to you. Don't focus hard on FINDING a subject, just skim the paper and let your mind wander. Second, possibly write about a childhood experience that has stayed with you. And third, you could try either writing about a negative experience that you shared with a good friend, or a positive moment shared with an enemy or someone with whom you normally don't get along. No matter what you choose to write about, be sure to include specific imagery and detail, and keep the five senses in mind. When you decide what to write about, write your first notes or first draft rapidly, without censoring yourself. Don't worry about structure, rhyme or grammar. Just get words on paper and see where the process takes you. 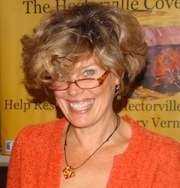 Barbara Buckman Strasko, first Poet Laureate of Lancaster County, Pennsylvania, and 2009 River of Words Teacher of the Year. Her new book is Graffiti in Braille, published by Word Press. Today's Write The Book Prompt was suggested by my guest, Barbara Buckman Strasko, who says this is an amalgam of various exercises she's found helpful in the past. The prompt helps to access otherwise subconscious thoughts, feelings, and ideas, which is so valuable when when we're writing poetry. Take notes about or answer the following questions. Barbara says it's best to consider each question individually, without looking ahead at the next one. You can then use your notes to write a poem. Or if you're lucky, the poem will form itself! What have you lost ? Where do you think what you lost is? If you had what you lost, what would your words taste like? If you had what you lost, what would your name not sound like?